We received these items for review purposes, product placement, as parts of gift bags and as purchases. As always all opinions are honest and my own. I’ve loved wearing matching shirts with JustaBXgirl since she was tiny. Every once in a while we will do a complete matching outfit. One thing that I have grown to love over the years is being coordinated with her. As she gets older I worry that the day is quickly approaching where she won’t want to look like her mama. Today, she still gets excited and even asks me to match her at times. I will hold onto that for as long as I can. And while she is into the whole #Twinsies thing I will take advantage of all the perfect mommy and me photos. Having said all that you would think that I would be on top of things when it comes to our vacation outfits. Sadly, I’m not! I be straight up SLACKING when it comes to getting ready for trips. It is like I completely put the trip out of my head until a few days before then I can kick myself because I can’t pull together cute, coordinated outfits like I see so many people do on Instagram. You’ve seen the photos, we might look cute but are rarely coordinated. I wanted this trip to be different. I wanted us to have at least a few coordinated pieces. Fortunately, a few brands believed in my vision and sent us some items to help make sure that we can look cute on social media while we sightsee in Paris and Iceland. We are even going to be cute and coordinated while we travel thanks to our friends at Kappa. See? I have never been and more than likely will never be one of those women that will look like I’m stepping out of a fashion magazine when at the airport. I’m about comfort when traveling. I love a good pair of track pants, a hoodie, and some fuzzy socks. I’ve already gotten JustaBXgirl into the habit of being comfortable for flights. Kappa supplied JustaBXgirl two tracksuits for our trip in two of her favorite colors (red and yellow). She has decided that she will wear one each way. This mama got her own pair of Kappa track pants for the journey. And once we get there we will be tres chic thanks to our friends at Twindollicious and Smash + Tess, Kid City and surprisingly enough a few finds I picked up on Walmart’s site! Twindollicious has always been trendsetters. Inspired by two of our favorite Kid Influencers we love how magical and whimsical the clothing in their line tends to be. These pieces (one of which happens to be on sale) are definitely whimsical. JustaBXgirl cannot wait to twirl away in front of the Eiffel Tower wearing the ruffles dress. And while she is twirling away, this mama will be comfy and stylish rocking my Jilly Jumper from Smash + Tess. I am such a fan of rompers. And this one is so soft that you will be seeing me living in it all summer. It is casual enough that you can wear it every day doing day to day errands but still stylish enough that it can be dressed up and make you feel fabulous! To see the fun we found at Kid City, check out the fun shopping haul video that JustaBXgirl did. You can find it in last week’s #FashionFriday post, here. 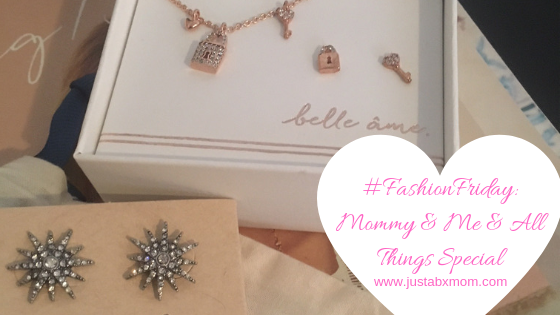 As for our Walmart finds, you’ll have to wait and see those on our Instagram accounts, JustaBXmom and JustaBXgirl. And we all know that no outfit is complete without the perfect accessories! Tina from Beauty Bella NYC provided us with the perfect accents. It just so happens that Chloe + Isabel had a whole Paris collection. The pieces we went with from the collection are a perfect fit for us. They were inspired by the Love Bridge and the Eiffel Tower. I can’t wait to put all of these into action and I can’t believe our trip is only a week away!